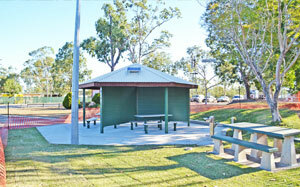 The project to fund and erect a lasting memorial to road safety advocate and community stalwart has been achieved. 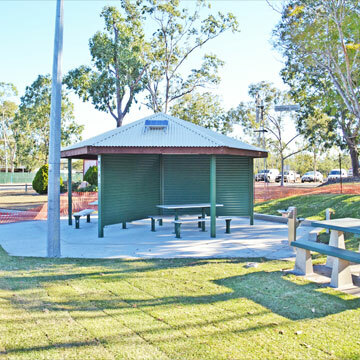 Mayor Anne Baker will open the large specially procured shade shelter, complete with solar lighting, spectacular drink fountain, all funded by the Nebo community and donations from Isaac Regional Council, Rio Tinto, Walkerston Rotary, Freemasons, Civeo and local companies. “In honour of Susie Whitehead our “Nebo Community Road Safety Warrior”. Giver of love and laughter to the world, and a selfless people person. Susie was deeply involved with many community projects throughout her life. A member of the Nebo Community Development Group Inc, Susie was leader and media spokesperson for the Roadsafe Campaign developed to focus safety aspects and successfully received funding for the Peak Downs Highway. To highlight fatigue awareness Susie coordinated the many 24 hour, 14 day Nebo Roadsafe September Rest-stops, manned by volunteers, supported by RAAG, mining companies and the whole community, combined with numerous core-flute crash site signs along the highway will be long remembered. The generosity of Community, Council and Companies has enabled this rest area facility upgrade to honour Susie’s advocacy of safe driving and fatigue awareness and to be a constant reminder for road safety on this highway. Friends of Susie, rest stop volunteers, truckies, mine workers, couriers, all who benefited from Susie’s amazing efforts are invited. Refreshments available.